Hua Hin (Thailand) – February 27, 2018 (travelindex.com) – A glittering grand opening ceremony has been held for Holiday Inn Vana Nava Hua Hin, Asia’s first Holiday Inn water park resort, which is set spectacularly on Thailand’s Gulf coast, just 2.5 hours’ drive from Bangkok. More than 400 guests, including many celebrities and VIPs, attended the event, which took place on Saturday night. They included owners Proud Real Estate, who are the developers of Holiday Inn Vana Nava Hua Hin as well as the adjacent Vana Nava Hua Hin Water Jungle, and senior executives from InterContinental Hotels Group (IHG). Guests were treated to an action-packed evening of live entertainment, including a show from popular Thai actress Jenny Tienposuwan, and an exclusive concert by iconic Thai pop star Tata Young. These performances were followed by an extravagant, extended firework display that lit up the night sky, watched from the resort’s towering Sky Deck. Easily accessible from Bangkok and two international airports, Holiday Inn Vana Nava Hua Hin is perfect for all types of stays, from fun-filled playcations to couples’ breaks, family holidays and unique business events. The hotel is part of a larger mixed use development that is Vana Nava Hua Hin. It is right next door to Vana Nava Hua Hin Water Jungle that first opened its doors to the public in 2014 with overwhelming success. 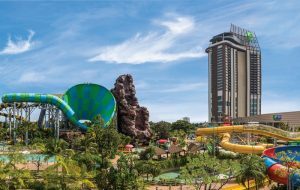 Boasting 20 world class slides and attractions surrounded by over 200,000 trees under the concept of a “water jungle”, the waterpark has welcomed close to a million visitors since and it is one of the biggest names in waterparks in Thailand. The project will also feature premium residences, expected to be launched later this year. Linking all components of the project together and ensuring a seamless customer experience is the unique RFID Technology, which can be used to unlock hotel rooms, access the waterpark and pay for food and entertainment within the compound. As the highest hotel in Hua Hin, Holiday Inn Vana Nava Hua Hin is expected to become an iconic destination. With 360 degrees views from the rooftop, guests can watch stunning sunrises over the Gulf of Thailand in the east, and enjoy golden sunsets over the hills in the west. Clarence Tan, Managing Director Southeast Asia and Korea, IHG added: “We are delighted to be extending our partnership with Proud Real Estate. They have been a valued partner of IHG for a number of years since we opened InterContinental Hua Hin Resort in 2012. We are proud to work with partners who have such commitment to bringing our brands to life and with a strong vision to build innovative resorts that put guests first. The hotel features 300 rooms and suites, including a series of inter-connecting rooms and KidSuites®, with special ‘secret’ rooms decked out with bunk beds and play areas. Children aged 12 and under can stay and eat for free, and all guests are offered free Wi-Fi and unlimited access to Vana Nava Hua Hin Water Jungle. When they are not playing in the Vana Nava Hua Hin Water Jungle, guests can unwind in the resort’s own extensive facilities, including a dramatic 26th floor infinity pool, the Tea Tree Spa, a 24-hour fitness centre, kids’ club and children’s pool. Dining and entertainment options include the all-day Plamong Restaurant, casual Pool Bar, and the stylish Vana Nava Sky Bar, Restaurant & Observation Deck, which offers spectacular views across the Gulf. Designed by Bangkok-based consultant Ashley Sutton, the mastermind behind some of Asia’s most famous bars, including Maggie Choo’s and Iron Fairies in Bangkok and Ophelia in Hong Kong, this dazzling destination also features a dramatic glass-bottomed deck 110 metres above ground and is set to become a “must-visit” destination for visitors to Hua Hin. Holiday Inn Vana Nava Hua Hin is also an attractive new option for event planners. With five function rooms and one of Hua Hin’s largest ballrooms, the resort is likely to become an important destination for the Thailand’s MICE industry. The grand opening party for Holiday Inn Vana Nava Hua Hin marks the arrival of a new landmark on Thailand’s Gulf coast, and a new era of hospitality in Hua Hin. Started over 65 years ago and with over 1,200 hotels worldwide today, the Holiday Inn® brand is the most widely recognised lodging brand in the world. Holiday Inn® believes the Joy of Travel is for everyone. The brand stands for delivering an affordable, enjoyable hotel experience where guests are always welcomed warmly. The first Holiday Inn opened its doors in 1952, and today the Holiday Inn® Brand Family is the largest hotel brand in the world, with the largest development pipeline. The ‘Kids Eat & Stay Free’ programme, available at every Holiday Inn® property, demonstrates the long-standing commitment of the Holiday Inn® brand to serve family travellers. InterContinental Hotels Group is a global organisation with a broad portfolio of hotel brands, including InterContinental® Hotels & Resorts, Kimpton® Hotels & Restaurants, Hotel Indigo®, EVEN® Hotels, HUALUXE® Hotels and Resorts, Crowne Plaza® Hotels & Resorts, Holiday Inn®, Holiday Inn Express®, Holiday Inn Club Vacations®, Holiday Inn Resort®, avid™ hotels, Staybridge Suites® and Candlewood Suites®.